There is a powerful sense of life and audacity in the colours and forms that leap out of a great display of Russian art currently on view in the centre of Brussels. An exhibition of over 300 paintings plus sculpture and films from all over Russia is currently gracing the grand halls of the Bozar, Brussels’ Palace of Fine Arts, designed by Victor Horta. It is part of a major festival centred in Belgium, organised by Europalia in association with the Russian government. Drawing from the state collections in Moscow and St Petersburg and augmented by loans from museums in the far-flung Russian provinces, French and Russian curators have put together a brilliant show of Russian avant-garde art between 1900 and 1930. Since the late 1980s, when the glasnost movement opened up the sealed storerooms where banned art had languished for decades, it’s been possible to see work by the artists who turned conventions upside down, movements described by their first historian, Camilla Gray, as “the great experiment”. 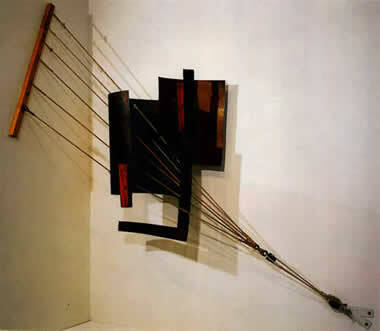 This exhibition’s full name, is “The avant-garde - before and after”. 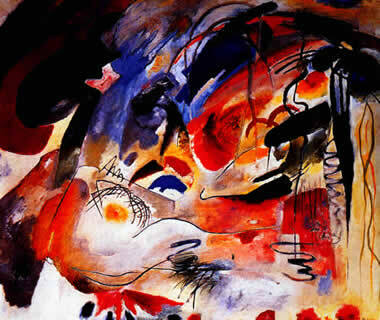 In reality, it shows the artistic vanguard before, during, and after the Russian revolution of 1917! Christian Kieckens’ outstanding exhibition design allows the viewer to appreciate the astonishing diversity of art movements in Russia over the next 25 years through a series of thoughtfully arranged spaces. The grand opening space is dominated by a screening of the famous Odessa Steps sequence from Eisenstein’s film Potemkin, made to celebrate the 1905 sailor’s mutiny, which sparked the wider revolution of that year. From cinematic high drama we move to paintings of the 1900s, with the poetic landscapes and gardens of painters like Vrubel, Larionov, Kuindzhi and Levitan, to name only a few. 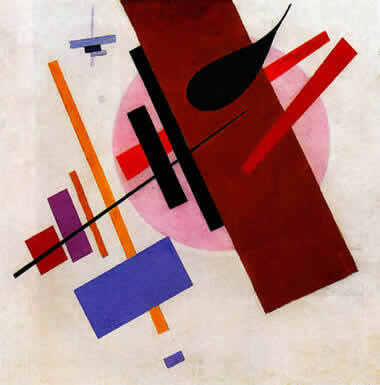 There are many great individual masterpieces and well-known names here, including Kandinsky, Goncharova, abstract painters such as Malevich, the astonishing group of female artists – Rozanova, Popova, Exter – plus Constructivists like Tatlin, Pevsner, Gabo and Rodchenko. 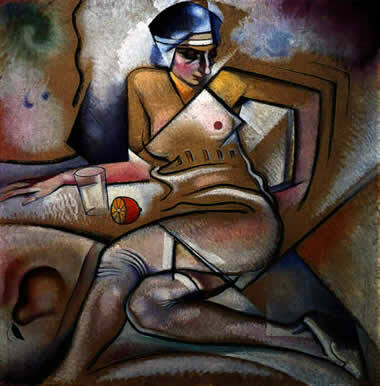 We can see that figurative painting and sculpture as well as “Cubo-futurism” continued in the 1910s and 1920s in the work of painters such as Lentulov, Korolyov, Annenkov, Filonov and Chagall. Paintings, sculpture, stage and costume designs, posters and photographs are accompanied by seven films, including The Young Lady and the Hooligan by the poet Mayakovsky and Evgeny Slavinsky from 1918, and Aelita, an allegorical science fiction story set on Mars from 1924. Perhaps the most poignant and disturbing account of what happened to the avant-garde is a 55-minute film by Alexander Krivonos, Russian Avant-Garde – a romance with the revolution, made in 1999. Newsreel footage shows events from the early years of the revolution and the Institute of Artistic Culture – the Russian “Bauhaus”. Through the personal fate of art critic Nikolai Punin, the horror of Stalin’s imposition of Socialist Realist dogma become clear. Punin was arrested three times, dying in a Siberian gulag in 1953. There is not space or time here to describe the breadth of experience on offer and the great range of artistic movements and the feeling of excitement and fearless experimentation. 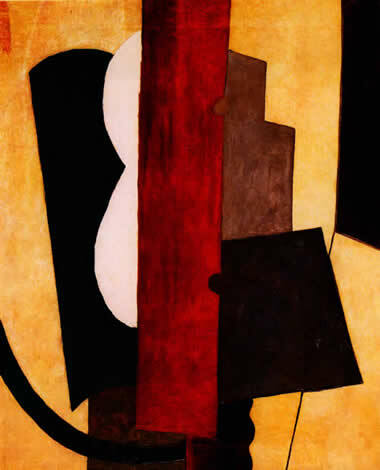 The outpourings of these artists had the wind of social revolution blowing through them and were, albeit briefly, supported by those placed in charge of Soviet culture immediately after the revolution, in particular Anatoly Lunacharsky, the Bolshevik Minister of Culture. London’s Hermitage Gallery gave a glimpse of the transformation of culture in last year’s Circling the Square – avant-garde porcelain from Revolutionary Russia, but in recent years, the sweep and diversity of the Russian Avant Garde have been on view abroad rather than the UK. Thanks to Eurostar, Brussels is as easy to reach as many cities in the UK, and it’s worth making the trip, especially as this show won’t be travelling. 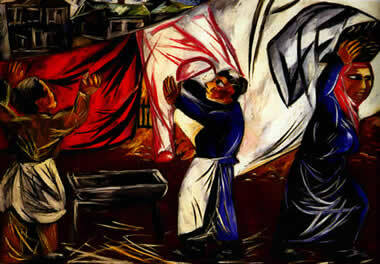 Russian Avant-Garde runs until January 22 at the Bozar, Brussels. More information at www.bozar.be Closed Mondays. * Exhibition catalogue: The Avant-Garde, before and after, edited by Yevgenia Petrova and Jean-Claude Marcadé, 35 euros. Palace Editions/Europalia, 288pp. Also part of the festival : photo installations by Sergei Bratkov; From Tsar to Emperor, Moscow-St Petersburg; The Trans-Siberian Express; The Huns; Soviet Idealism, painting and cinema 1920-1939 ; Moscow’s Seven Sisters 1935-1950; Fabergé – Jeweller of the Romanovs; Russian Symbolism – The Blue Rose.